‘Tis the season for Pumpkin Spice Everything, and companies large and small are gearing up for the last quarter of the year. For most, this is the final stretch in a yearlong sprint to hit those 2017 targets, fulfill increased revenue goals and achieve super-sized sales quotas. So what does upper management do to kick office morale into high gear? They organize a potluck. Oof. That’s right, office mates! you’re headed to yet another afternoon of room temperature food. Vegan lasagna! Lactose-gluten-joy-free cupcakes! Maybe there’ll even be an ice-breaker or two, and maybe everyone will sit around the conference room passively chatting about their weekend plans. Regardless of how the visual plays out, the attempt at building friendships will remain subpar. Despite the best of intentions, locking people in a room for any period of time does not guarantee any kind of meaningful relationship. Just ask anyone that’s gone on a first date to an escape room. Offices are a funny thing. Not only are they an odd mix of characters (who under regular circumstances would most likely never spend time together), they also come with a very interdependent nature. These relationships are often under uniquely stressful situations, where you have no choice but to rely on the strengths and make up for the weaknesses of those on your team. So how do companies effectively execute team building activities that build a workplace filled with mutual respect and the motivation to succeed? The answer is almost as clichéd (but just as classic) as chips ‘n dip: focus of making lasting memories. Spend more time laughing together and less time sorting out Tupperware when you book your office outing at The Second City. We specialize in creating the kind of camaraderie you won’t find charted in a Q4 report. Having something to smile about, other than Timbits in the lounge, is just the fuel your team needs to make it through the final stretch. Those shared moments go on to become the glue that holds your team together through the toughest seasons, and your bottom line will be better for it. Whether you head out early for a matinee show and lunch package or take the morning off for a private improv class, no one will ever turn down the opportunity to be part of a company-wide inside joke. Give people more of what they need…and less of what’s outlined in the HR handbook. 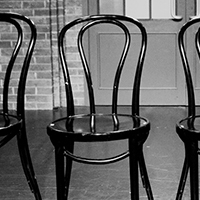 Be the office hero this year by introducing your team to the world of improv – Chat us up Group Sales Department – 416-343-0011 ext 201 | groupsales@secondcity.com!